If your iPad is not functioning correctly, come see iDeviceMD in Atlanta for iPad repair. Our team is fully certified and treats every customer with kindness and respect. We can have your iPad repaired in just a few minutes, especially with an appointment. We likely have an available time today if you call now! iDeviceMD only uses high quality replacement parts; never cheap or imitation pieces. Parts and workmanship are always guaranteed. If you’re not 100% satisfied, let us know and we will make it right. We are the most trusted source for multiple sources of damage. We can handle water damage, cracked screens and battery replacements. Sometimes even the most careful iPad owner ends up with a cracked screen. 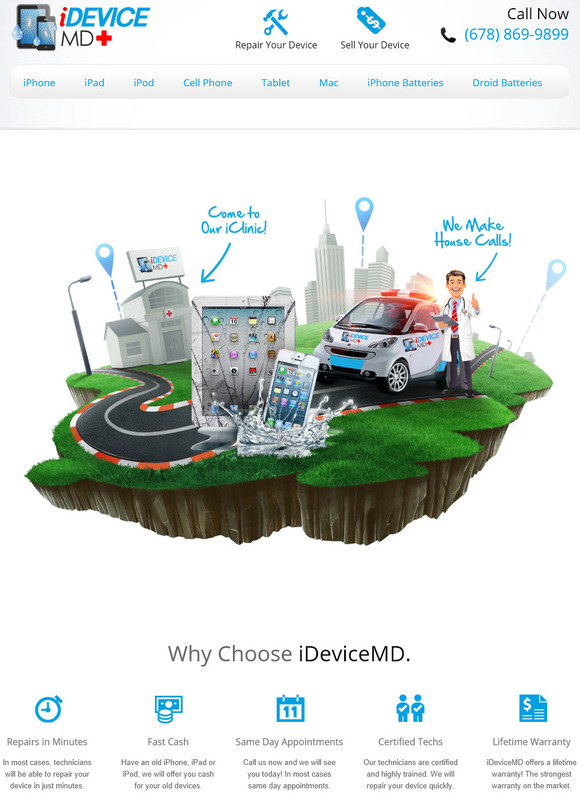 iDeviceMD is standing by for your iPad screen repair. Our knowledgeable technicians can repair your iPad quickly, at a low-cost rate. You deserve a flawless touchscreen that doesn’t cost a lot of money. If it’s spider cracks or a fully shattered screen, come to iDeviceMD for seamless glass installation. Make an appointment and your iPad will look and function like new in about an hour. Your new screen comes with a warranty that is unmatched by other companies. We guarantee your satisfaction. Touchscreens with cracks are frustrating to navigate. iDeviceMD offers same-day iPad screen replacement. We lead the market with excellent customer service and guarantee all parts and labor for the life of your device. Our technicians are available to repair iPad Mini, iPad Air and models 1, 2 and 3. If by chance, the damage is too extensive we will let you know and you owe nothing. Don’t forget about our outstanding buyback program. If you have older models laying around you no longer use, bring them to your appointment and we may be able to trade them for cash!